1. Miracles, siddhis, and Sai Baba's powers: an introduction. 2. Basic powers demonstrated in direct personal contact between Sathya Sai Baba and his devotees. 3. Other public manifestations of powers. 4. Powers demonstrated at a distance. 5. Evidence of other aspects and dimensions of Sai Baba's powers. 6. The power to transform: towards the goal. Epilogue - for now. Glossary of Sanskrit and cultural terms used. 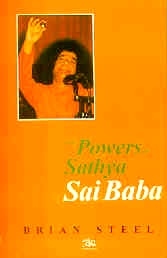 "This addition to the already huge literature about the Indian religious leader and teacher, Sathya Sai Baba, is the first book to attempt a detailed classification and description of the wide range of special powers manifested by, or attributed to, this Guru whom many millions of followers all over the world regard as God incarnate."